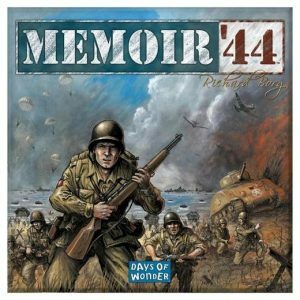 Memoir ’44 is a WWII war game inspired by the fighting on the Western Front in 1944. 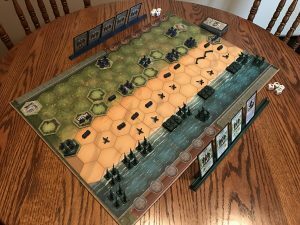 It includes a two-sided board (field and beachhead) and a stack of different terrain hexes that let you construct a series of different battles. Most of the fighting is between American and German armies, represented by two plastic armies of different colors. There are a couple of scenarios with British commandos and French Resistance for good measure though. The board is divided into three sections: left, center, and right. Each player has a number of cards and alternate playing them one at a time, drawing a new a replacement at the end of each turn. Most cards will let you order a certain number of units in a given section (e.g. Attack Right – Issue an order to three units on the right flank). Other cards will have special orders that aren’t defined by their sector, like an Armor Assault (Issue four armor units an order). Battling happens by rolling a series of dice based on the unit you’re using and the distance from which you are engaging. You destroy enemy units by rolling the unit’s symbol or a grenade. A flag makes the enemy retreat. Stars are usually a miss, but certain cards such as Air Power will count them as a hit. The goal of the game is to collect medals, usually around five or six. The first to collect the number of medals designated by the scenario wins. You collect medals by capturing and holding special objectives, such as bridges and towns, and by eliminating enemy units. 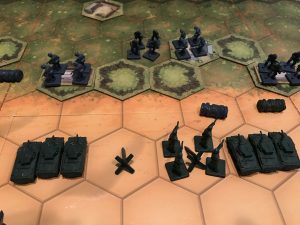 Memoir ’44 is a two-player game and each game takes about an hour to play. There is an option that lets you put two boards together to play what are called Overlord scenarios, which let you play with six to eight players. Memoir ’44 is easy to learn. After the first turn or so, everyone to whom I have taught this game has gotten the hang of it. There are also more basic rules if you want to teach kids how to play. This is a great option if you want to break out a designer game but don’t want to deal with overly complex rules. The hex terrain gives the game great replay value. The instruction booklet includes sixteen different battles. The diversity of cards and dice rolls makes even the same battle play out differently. I have put hours and hours into this game and still don’t feel like I’ve exhausted it. The game system is flexible enough to accommodate a wide array of expansions as well (more on some of those to come). This game comes with the added benefit of learning something. Each battle begins with a brief historical overview so you know where this fits in the war. I like playing out these battles while also learning a bit about WWII in the process. The game is well constructed. The German and American armies are different molds, rather than just different colored plastic. The hexes are thick and durable. This game will hold up with lots of use. In my opinion, the cards are a mixed bag. I like how they diversify the game and add in some surprise. However, you can be in serious trouble if you get bad cards. I’ve had a few games where the other player is hammering one of my flanks and I can’t get any cards to play on that side. It’s rare not to have at least some option, but it’s discouraging when it does happen. It’s a dice game. Personally, this doesn’t bother me but I know some people really don’t like dice games. At the end of the day, you can position your units in just the right spots, use the terrain just right, and still get thwarted by dice rolls. You’ll have to decide how heavily that weighs on your gaming experience. I really like Memoir ’44. It’s a fun war game that occupies a middle ground between being too casual and too involved. It’s short enough to break out without a major time commitment, but complex to give you a satisfying strategic experience. It’s fast paced without being shallow. This isn’t a full-fledged Axis and Allies type of experience, but it’s a very satisfying experience in its own right. This entry was posted in Articles, Board Games and tagged Board Games, Review, Strategy, Tom, World War II, WWII. Bookmark the permalink. It’s a really easy, light game with historical significance. If you’re looking for a more interesting, meatier experience, consider Conflict of Heroes or Advanced Squad Leader Starter Kit 1, or perhaps Combat Commander. I’ve never played Advanced Squad Leader, but I’ve heard really great things about it. It’s on my list to check out sometime. Sounds great! I’ll be sure to do that.